It’s time to sit down at your computer, press the power button, and prepare yourself to be completely overtaken by a world beyond your imagination. Or, at least, that’s how I feel at the end of the day when I go and log onto my online games. Of course, there is one thing that can make it a truly immersive experience, and one thing that we all need as PC owners. 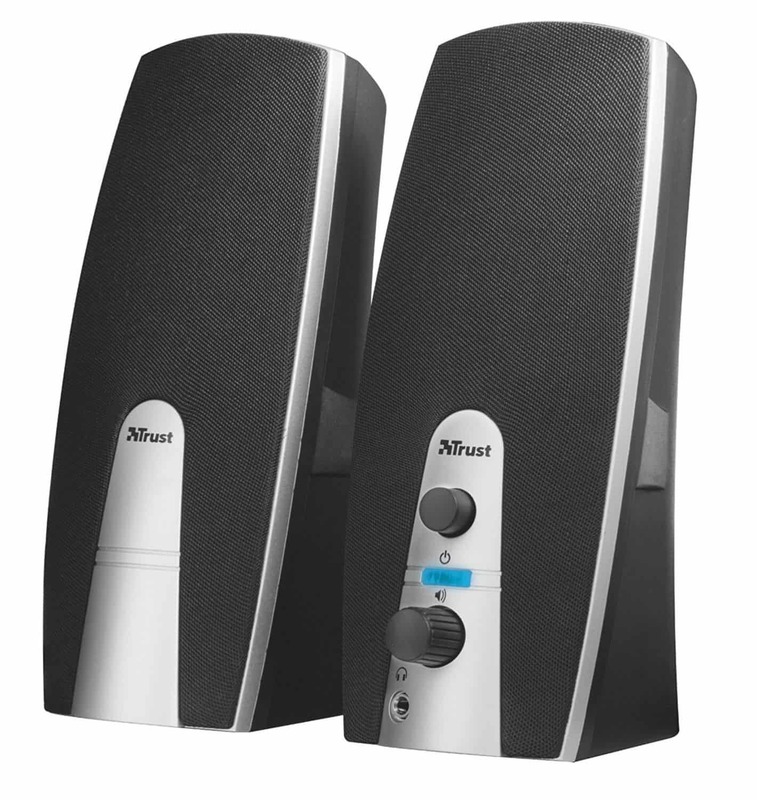 A good and reliable set of speakers is perfect for any computer user, whether you are a video game fanatic or simply like to listen to music while you work or surf the web. Regardless of what you use them for, they can make life with your PC that much easier. You need a good set, and they don’t have to cost you a fortune either. You can actually pick up some good quality models from leading brands for less than £50, and that will have you ready to go in no time at all. We know it’s not easy to pick the right set, or know what’s right for you, but we are here to give you a hand with things. In order to help you find the best PC speakers under £50, we have put this guide together, compiling all of the relevant PC speakers under £50 reviews in one place, allowing you to find the ones that work best for you. What is a PC Speaker? You might be wondering what exactly a PC speaker is and why you even need them. To answer the second question first, the reason you may need them is that not every PC comes with internal or external speakers, and often the ones that are provided are substandard. As a result, you are going to want some good quality speakers so that you can hear game music, or simply watch videos on YouTube. Now, how do they work? Well, the answer is actually pretty simple. You can hook the speakers up using a designated USB port or the sound output jack (all depends on your PC). Once plugged in, you might be taken through an installation wizard before you can start using them. When they are operational, the speakers will receive an audio input from the sound card in the PC and transform it into audio output in the form of soundwaves – hence you can hear the sound. Now that you know a little more about how they work, check out the PC speakers under £50 reviews below and see what you think. 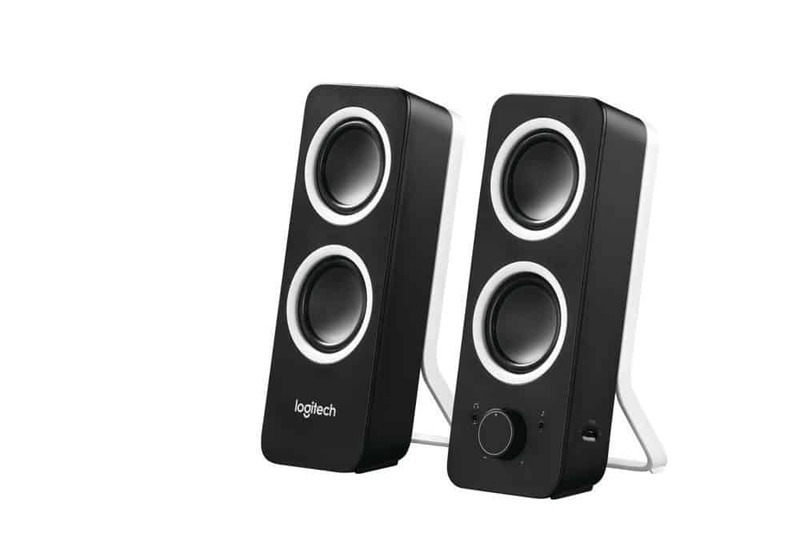 Logitech is one of the biggest names in the audio industry, and anyone who knows even a little bit about computers can tell you that this is a top brand that produces quality items. These speakers are no different, and all you need to do is have a little read below to see what we’re talking about. These PC speakers come in black and white or white and black, which means you get to pick the ones that you like most and that fit with your current setup. The controls on the speakers themselves are really easy to access as well, so you have an experience that is both easy and effortless. You even get the added bonus of a headphone jack if you feel like having a more personal experience. The bass is easily adjusted according to your own preferences by simply turning the wheel control on the speakers. This ensures that you have a rich and full audio experience, regardless of what you are listening to at the time. The AUX connection also allows for multiple devices to be connected at any time, and it is compatible with all operating systems, including iOS, ensuring for complete inclusion. Some customers found the AUX lead to be a little short for their liking. These PC speakers come at a budget price that just about everyone can afford comfortably, making them a prime choice for anyone who is looking for good quality, but cheap, speakers. While the AUX lead is a little shorter than some would have liked, it is possible to pick up extenders so that they provide a better reach. When you consider the price, everything is pretty good, from the clear sound to the easy tonal adjustment. Alongside great connectivity, it is a top choice for any PC user. Creative is another great name, and one that will leave you feeling really excited once you get their speakers up and running. If you want a reliable set of budget speakers for your PC, these could be just what you have been searching for. Why not take a moment to read below and find out more? These PC speakers come in a set of three, and have a really sleek box design in black that looks absolutely fantastic on any desk. Despite this, it is a really compact, fitting in nicely with the rest of your equipment without taking up all of your spare space. The controls are conveniently located on the side of the main speaker, with a discreet knob that allows you to make delicate adjustments. The sound is fantastic, with an incredibly natural feel that will leave you more than a little impressed. 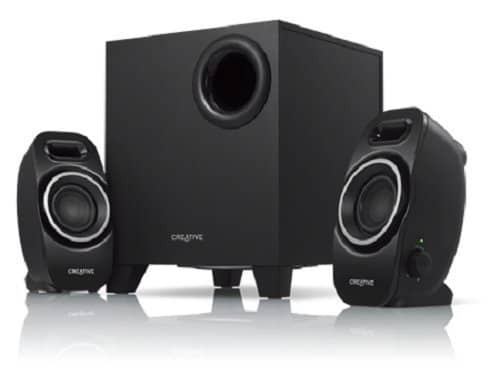 The centre speaker is actually a subwoofer that delivers an incredible bass that will rock you to your core. The tonal accuracy is unreal, and every moment spent listening reinforces the excellence offered by this device. The connection to your PC is also pretty straightforward to follow. There is no headphone socket, which some customers found disappointing. These PC speakers are ideal for gamers and web surfers alike, offering everything you need to get the most out of your computer experience. While some have been disappointed about the lack of a headphone socket, if you do need to plug some in there isn’t much effort to switch things around. The sound quality is unbelievable, and they come at a price that you will be incredibly happy to pay for such an excellent quality set of speakers. Trust, like its name, is a brand that you can trust to delivery quality and reliability in all of its electrical equipment – especially when it comes to PC speakers. These could be the ideal ones for your setup, so take a moment and read below to see if these are going to be the right ones. These PC speakers comes in black with silver detailing, and have a classic design that you would expect from a standard pair of speakers. Even so, they are lightweight and a nice size, which means they won’t take up a massive amount of space on your desk and you will still have plenty of room left over. There is also a headphone connection on the front for quick and easy access. The controls for power and volume have been placed on the front of the main speaker, which makes them accessible, and the clear labelling ensures you know you are doing the right thing. They are USB powered as well, so there is no need for a main connection to get started. The sound quality is superb, with real sound that truly immerses you in what you are doing for the perfect experience. Some customers feel that there could be more bass and that the sound can be a little tinny at full volume. 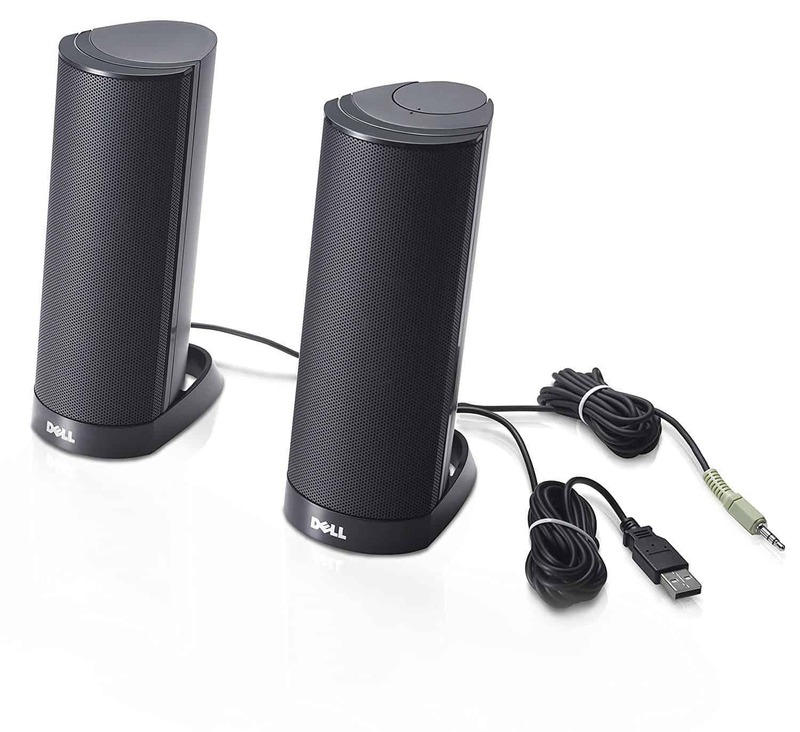 These PC speakers are incredibly cheap, making them the ideal set for those who are on a really tight budget. While there are some that would have liked more bass, and others who felt the sound was tinny at max volume, the overall quality of sound is actually really impressive when you considered how cheap they are. Plus, they have a headphone jack, easy to access controls, and they are very simple to get installed and ready for use. Here are some further models of PC speakers, just in case the ones above do not quite meet your requirements. This PC speaker comes in five different colours, so you can pick the one that suits you most for your computer desk. It connects up to your PC using a USB connection, and the speaker is only small so it doesn’t take up a massive amount of space. 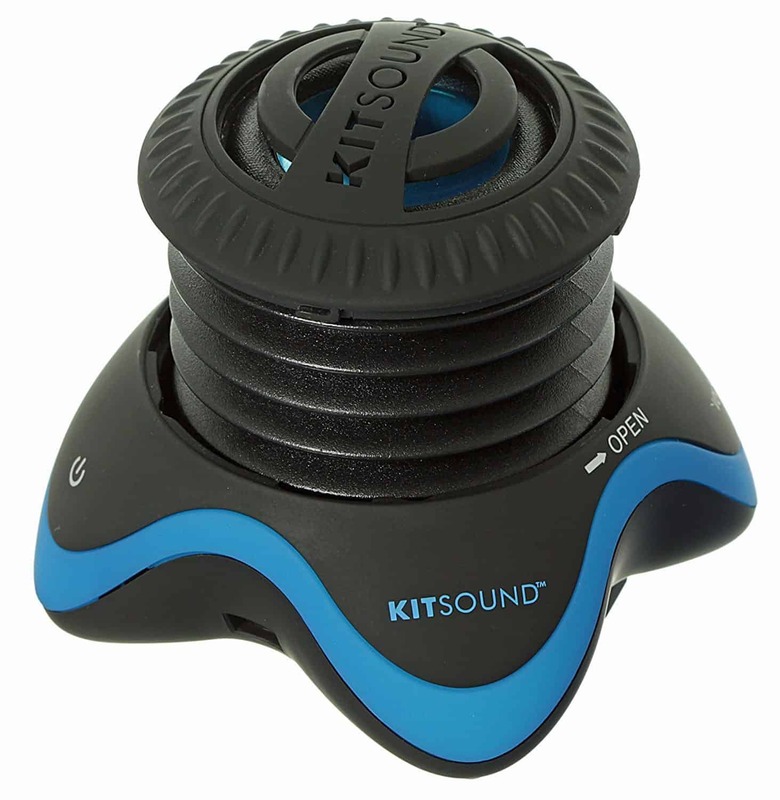 It is also compatible with a number of different devices, and you can link multiple speakers together to create a volume that is both louder and filled with depth for your gaming experiences. The expanding body of the speaker makes for a good level and quality of sound while you are plugged in, and the batteries are completely rechargeable, lasting for an impressive six hours and only needing two in order to charge. Overall, it’s really easy to use and incredibly versatile with a very good price tag. They have a tall, almost cylindrical, design that stands anywhere you want on your desk, but they aren’t so big that they are going to become all encompassing. They plug in really easily, ready to go and bring your PC to life with a fully immersive and exciting experience. The sound quality is superb, with a crisp and clear level for both the spoken work and music, something that you need when searching for PC speakers. They are only compatible with Dell PCs though, so make sure you check that yours is going to work with them before you decide to buy. Hopefully, this guide has helped you to find the best PC speakers under £50, and it has given you some guidance when deciding which speakers are going to work best for both your bank, and your entertainment when playing games or streaming tunes. What we have done with this guide is gather a fantastic selection of affordable speakers that will help you stick to your budget without compromising on quality. They come from reputable brands, and none of the speakers here are over £50, with a good selection of prices for everyone within that budget. There are so many differences and similarities with each model that it is near impossible to choose which is best. Of course, you can’t go wrong with a Logitech as they are one of the best brands on the market, but each model has its own strengths and weaknesses. Either way, the perfect budget model is here and waiting for you. What did you think of our PC speakers guide? Are there any that you would have liked to see or recommended? We love hearing from you, so make sure to leave us a message in the comments below.